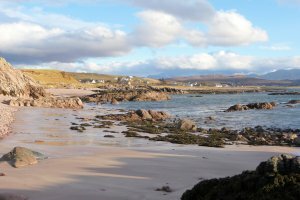 Aultbea and Gairloch lie in a beautiful coastal area of Wester Ross, with superb white sand beaches, wide open spaces, and big skies. A few miles away to the south and east there are several well-known Scottish mountains - Slioch, Beinn Eighe, Liathach and Beinn Alligin, to mention but a few. A short distance away to the east are An Teallach and the Fannichs, all mountains well-known to Munro-baggers, whilst to the north, beyond Ullapool, are Stac Pollaidh, Cul Mor and all the mountains of Sutherland - Canisp, Suilven, Quinag, Arkle, Foinaven, etc. 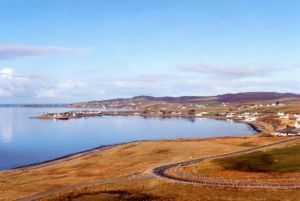 The coastal area in the immediate vicinity of Aultbea and Gairloch has gentler and more undulating countryside, an area of sea lochs and spectacular sandy beaches. Always, in the distance, however, there are big mountains to be seen on the horizon. The photo to the left shows a view of the lovely beach at Mellon Charles, just one of the numerous superb beaches within a short distance of Tranquility B & B. 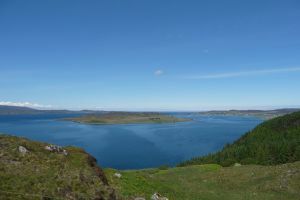 There are others at Gruinard Bay, Firemore Cove, Mellon Udrigle, Aultbea, Red Point and, of course, Gairloch. Despite being so far north, this part of the North West Highlands enjoys a generally very temperate climate, courtesy of the Gulf Stream. This is ably demonstrated by the spectacular Inverewe Gardens at Poolewe. These were established in Victorian times by local landowner, Osgood Mackenzie, and contain exotic plants from all around the world. For those interested in gardens and horticulture, there is the Tournaig Cottage Nursery and Gardens just a short distance south of Aultbea. Scotland is, of course, the home of golf, and many who visit the Highlands like to bring their clubs with them and enjoy a round or two. Golfers are well catered for, with the nearest golf course situated only a few miles down the road at Gairloch. This course has a lovely position just adjacent to the beach, and with superb views. Don't forget your camera! The other golf courses in the locality are at Ullapool to the north, and at Lochcarron to the south. The latter also has a superb position, on the north shore of Loch Carron with magnificent views all around. One of the main features of the Scottish Highlands is, of course, the wildlife and Wester Ross is no exception. The area boasts no less than 2 National Nature Reserves, at Beinn Eighe and Inverpolly. It is very difficult in the space we have available to do justice to this beautiful part of the world, as there are so many places to see and things to do. For anyone who enjoys peace, quiet, magnificent scenery, stunning sunsets, abundant wildlife, Wester Ross has it all. For those who are keen on walking, whether it be serious hillwalking and/or climbing, or simply a more gentle stroll, the possibilities are almost endless. If you prefer to tour the area by car or bike, may we suggest that this is perhaps the nearest you will get, in 21st century Britain, to a motorists' paradise - no motorways, no speed cameras, no traffic jams. We cannot guarantee, however, that you will not get held up from time to time by sheep standing in the middle of the road, or that you may not have to stop occasionally in a passing place on a single-track road - but you're on holiday, so there's no hurry, is there?! For more local views, please see our Photo Gallery. the pretty village of Applecross, some miles down the coast to the south of Gairloch, with its excellent beach and superb inn, approached via the Bealach na Ba (Pass of the Cattle), one of the highest and most spectacular roads in Britain. the picturesque fishing village of Shieldaig, and nearby Torridon with its excellent Countryside Centre. Badachro on the south side of Loch Gairloch, with the excellent Badachro Inn, and Red Point with its excellent isolated beach. the Perfume Studio, just a very short distance along the road from Tranquility B & B. This is Scotland's only working perfume studio and has a cafe and gift shop. 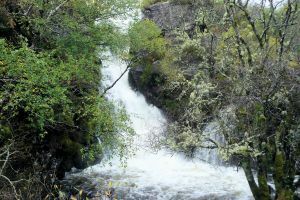 the mile-long Corrieshalloch Gorge which culminates in the Falls of Measach; the falls can be viewed from a suspension bridge. the drive through Inveralligin to Diabaig, another spectacular road, with an excellent coastal walk from Diabaig to Red Point. Kinlochewe and Loch Maree, one of the best known and most beautiful of Scottish lochs. Gairloch, where there is a fine beach, a golf course, an excellent museum, and boat hire and pony trekking are available. Poolewe, which was an important deep-water harbour during World War II and which has a modern swimming pool. the attractive little fishing port of Ullapool which has excellent facilities including a leisure centre, swimming pool, golf course, and a splendid museum. Here there is the ferry terminal for crossings to Stornoway and the Western Isles and cruises are available to the Summer Isles. A lot more information can be found from other websites related to the area - see our "Useful Links" page.